I received two World of Warcraft Guest Pass Keys when I purchased my WoW: Cataclysm boxed set, and I would like to give them to someone who would like to try out WoW for 10 days free. 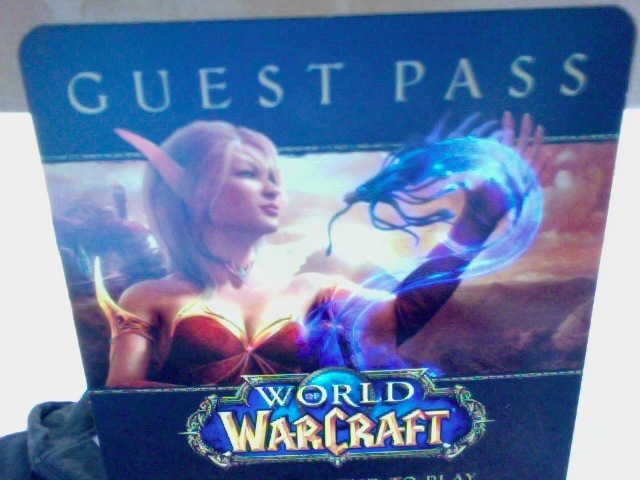 The Guest Pass Key allows you to download the WoW client software from Blizzard here and then play the game for 10 days. If you are interested, I can email you the Guest Pass key, or I can mail you the card stock Guest Pass card with key, which features a female blood elf grasping a mana wyrm (pictured above). It’s first come, first served. UPDATE: The keys have been delivered. Many thanks for those of you who stopped by and asked for them. Hello. Yes, I sent you an email to the address that you registered on my blog. If you would like one of the guest pass keys, just reply to my email and I will send it to you. Just a question. The gues pass card is linked to your account somehow? I mean, it works like the invite a friend tool or don´t? I bought a cataclysm too and just want to know if these guess passes are like invite a friend linked to may auth key of cata. Tkz. I’m sorry, but I don’t know the answer to your question. However, I don’t see anything in my account dashboard that connects the guest passes to my account.